'Microbial biomass C, N, and P (kg element ha-1 to 10 cm). "Mineralizable C (CO2-C) and NO3-N as kg ha-1 to 10 cm in unchloroformed 0-10 or 10-20 day incubations of soils sampled from the field. dNH4-N, NO3-N and extractable inorganic and organic P amounts (kg ha-1) in the top 10 cm of soil. From Elliott et al, 1984.
in the U.S. terminology). It is generally recognized that abundance of fungi and fungivorous arthropods is greater in these soils than in soils with a less-pronounced litter layer (Kühnelt, 1976; Wallwork, 1976; Pawluk, 1987; Blair et al., 1992). However, it is important to determine the amount of activity occurring in these surface layers as well. Ingham et al. (1989) and Coleman et al. (1990) have shown significantly greater fungal biomass and microarthropod biomass in L, F, and H layers under Pinus contorta (lodgepole pine), compared with mountain meadow. There was also a greater amount of fungal activity, as demonstrated by FDA-positive fungal hyphae (Söderström, 1977; Ingham and Klein, 1982). This forest experience is corroborated by Verhoef and De Goede (1985), who noted greater activity of Collembola in pine forests in Holland, contrasted with habitats which had a thin or nonexistent litter layer. Because energy flow is fundamental to the function of decomposer organisms and ecosystems, energetics could provide some fundamental constraints on soil carbon dynamics (Currie, 2003). Often, carbon is considered as a surrogate for energy in studies of detrital decay and carbon turnover in soils. By testing relationships between carbon and energy across samples of forest detritus above- and belowground, across decay stages, and between a deciduous and coniferous forest at the Harvard Forest in the United States, Currie (2003) found that energy and carbon concentrations were closely related (within 10%), as were ratios of heterotrophic energy dissipation to carbon mineralization across types of detritus (within 16%). These relationships should be borne in mind when we explore the energetics of detrital food webs, in Chapter 6. Other areas of interest in applied soil ecology include revegetation of mine spoils. Extensive studies in the United Kingdom, Germany, and elsewhere have been made of decomposition ecology and of microbial parameters in strip-mined coal lands (Bentham et al., 1992). Intentional manipulations (especially introductions) of earthworm populations have been used to enhance productivity of crop and pasture lands (Lee, 1995) and to speed organic waste decomposition via vermicomposting (Edwards, 2004), as discussed in Chapter 4. Several researchers (Tisdall and Oades, 1982; Roth well, 1984; Jastrow and Miller, 1991; Jastrow et al., 1998) have investigated the roles of saprophytic and VAM fungi in stabilizing macroaggregates. Rothwell (1984) suggests that there is a biochemical coupling reaction between glucosamines in the hyphal walls of the fungus with phenolic compounds released during lignin degradation from leaf and root tissues. An additional possibility, little investigated yet, is the apparently widespread occurrence of interspecific physical linkages that enable transfers of nutrients via mycorrhizae of various annual and perennial plants (Chiariello et al., 1982; Read et al., 1985; Read, 1991). Physical, chemical, and biological contacts may be operating simultaneously in mycorrhizal-mediated interactions. Recall the comments about the role of glomalin in promoting aggregate stability in soils as noted by Wright et al. (1999) in Chapter 2. 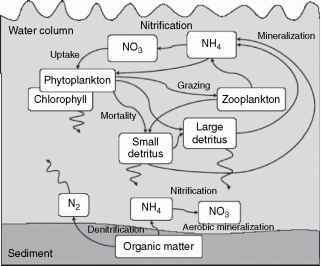 Some of the latter examples may seem a bit removed from the general theme: the role of soil fauna in soil processes. However, it is apparent from studies by Warnock et al. (1982), Moore et al. (1985), and Curl and Truelove (1986) that soil mesofauna, for example, Collembola, show considerable preference for, and have an impact on AM fungal growth, just as they do for saprophytic fungi (Newell, 1984a, b) and plant pathogenic fungi (Lartey et al., 1994). This impact undoubtedly extends to nematodes (Ingham et al., 1985) and soil amoebae as well (Chakraborty and Warcup, 1983; Chakraborty et al., 1983; Gupta and Germida, 1988; Gupta and Yeates, 1997).